Kilts, Kilt Making and details. KILTS and Scottish, Highland, Irish, Welsh and Celtic attire. KILT MAKING. Kilts made to measure from imported Scottish worsted wool kilting fabric. For individuals, formal occasions, weddings, everyday use, highland dancing, bagpiping, and country dancing. Tartans from the major Scottish woollen mills or specially woven for you. 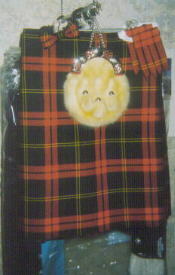 Scottish and Irish kilts in Feilidh Beag and Feilidh Mhor styles. Tartan sample books held for viewing at our premises in Hamilton. Barathea for Jackets (Craill, Argyle, Prince Charlie, Montrose styles). Taking measurements. If you want to find out the correct measurements for a kilt, refer to our sizing page. Tartan fabric for NZ conditions. What Tartan kilt to wear? What Kilt style to wear? For general information about kilts click here. Is your kilt too tight now? It can possibly be extended and made comfortable again. Straps, buckles, inner and outer aprons and adjacent pleats, can all be modified with excellent results, depending on the condition of the kilt. Bespoke tailoring of tartan trews and highland day, morning and evening jackets.